The basic route for the ‘Trip to the Tip’ starts from Cairns with two options. You can take the winding coastal road through Port Douglas and Cape Tribulation to Cooktown. From Cooktown the 4WD road runs inland through Lakefield National Park and on to Musgrave. Alternatively take the sealed inland route through Mareeba to Lakeland. From Lakeland it is a straight run through the centre of the peninsula to Laura. The next 300km section runs through Musgrave to Coen and then to Archer River. Beyond Archer River the road follows the Old Telegraph Track through the centre. There are options to branch off on side roads to Weipa in the west or to Lockhart River and Iron Range National Park in the east. Beyond the Wenlock River on the main route there is a further choice. You can follow the diehards on the Old Telegraph Track with its interesting scenery and many creek crossings, testing the strength and soundness of your vehicle. Alternatively, the cautious driver can take the longer but safer Bypass Road, which has loose gravel and bulldust, but fewer crossings. Around 58km from the start is the turnoff to the famous Captain Billy Landing on the Coral Coast. The Jardine River Ferry crossing is reached 36km before the main northern town of Bamaga. 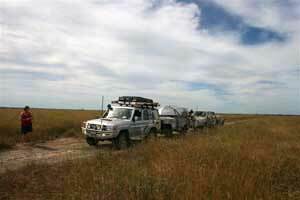 The overall journey from Archer River to Bamaga is 400km. From here the road runs directly up to Cape York, with branches to Punsand Bay to the west and Somerset ruins to the east. At the ‘Tip’ of Cape York there are pleasant walking tracks through rainforest and a sandy bay called Frangipani Beach. Clifftop walks give excellent views of Torres Strait over a turquoise sea. New Guinea is just over the horizon. 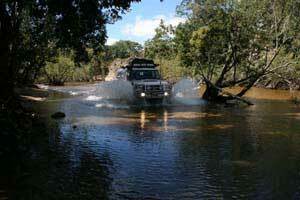 A Cape York Peninsula 4WD adventure is nirvana for off-road driving enthusiasts and an unforgettable experience. It can take the form of a self-drive journey, a tag-along trip where you follow an affinity group or an organised safari trip with a commercial operator. The best time to go is early in the dry season, say the beginning of June. There are fewer travellers then so the roads haven’t had time to get churned up. The last vehicles are usually out of the upper section of the peninsula by October. It is possible to have vehicles barged back to Cairns from the Cape but it is expensive. Best to play safe - there’s enough adventure for anyone just getting to the top.